Could ‘Development Impact Bonds’ work? This blog post first appeared on Views from the Center at the Center for Global Development. Last week, CGD and Social Finance launched a new high-level Working Group to consider Development Impact Bonds, a new mechanism to enable private investment in development outcomes. Owen Barder and Rita Perakis explain. When the market cannot provide – such as where the financial returns are not in line with the social returns – we often turn to public sector solutions. But that can bring new problems: government failures are different from market failures, but real nonetheless. Political time horizons can be short, leading to myopic decisions; budgets can be inflexible and siloed; performance management inadequate; and Treasuries and fiscal policies may constrain sensible investments. In developing countries, government failures can be compounded by the involvement of multiple aid agencies. This approach is now being tested in the UK, US, Australia and elsewhere. In the UK pilot developed by Social Finance, Social Impact Bonds are being used to pay for services which are intended to reduce reoffending by ex-offenders. Investors put money into a coordinating organization which funds a variety of interventions intended to reduce recidivism, such as training programmes, housing, and counseling. The investors will be paid by the Ministry of Justice (out of the savings they make lower prisoner numbers) if reoffending is shown to go down faster for this group of prisoners than with other comparable prisoners in the prison population. When this was launched in the UK, we asked whether this model had applications in development. For example, could donors translate social impact into a financial return for investors, in the way the Ministry of Justice has turned lower reoffending into financial returns for investors in the UK? Or are there development interventions which could yield sufficient financial returns to be attractive to investors even without donor support? Over the past few months CGD in Europe has partnered with Social Finance to explore the idea of Development Impact Bonds – to create a new way to invest in development. Could Development Impact Bonds be a way to engage the private sector to help improve the management of public services? Governments in both developed and developing countries find it difficult to manage service delivery contracts successfully. The private sector can be more effective at testing different approaches, monitoring performance, scaling up success and exiting from failure, creating incentives to do better, and is less susceptible to political pressures to misallocate resources. Purely private sector solutions can suffer from problems of access and equity, but can Development Impact Bonds harness the strengths of private sector management while using government money to ensure that services are accessible to the poorest? Can Development Impact Bonds provide flexible money to support outcomes instead of targeting money inflexibly on particular services? Governments organize budgets around particular services, and find it difficult to create flexibility to pool the money so that it can be used efficiently to solve particular problems. This is especially true if the spending has been programmed by aid donors, which usually leaves very little discretion for governments to move the money to where it will be used to greatest effect. But if payments are linked to outcomes, could there be more flexibility to spend the money in the most effective ways? Can Development Impact Bonds enable innovation to find answers for the ‘last mile’? It is a consistent challenge in development to provide equitable access to important goods (bednets, drugs, fertilizer) and services (clinics, schools, maintenance of water pumps). Getting these products to the poorest people often requires solutions tailored to local circumstances, and the ability to identify and overcome specific obstacles. Centralised development strategies supported by donors have often failed because it has been difficult to provide funding and support institutions with sufficient flexibility to innovate, test ideas, react to local conditions, and enable locally successful solutions to emerge for these ‘last mile’ problems. 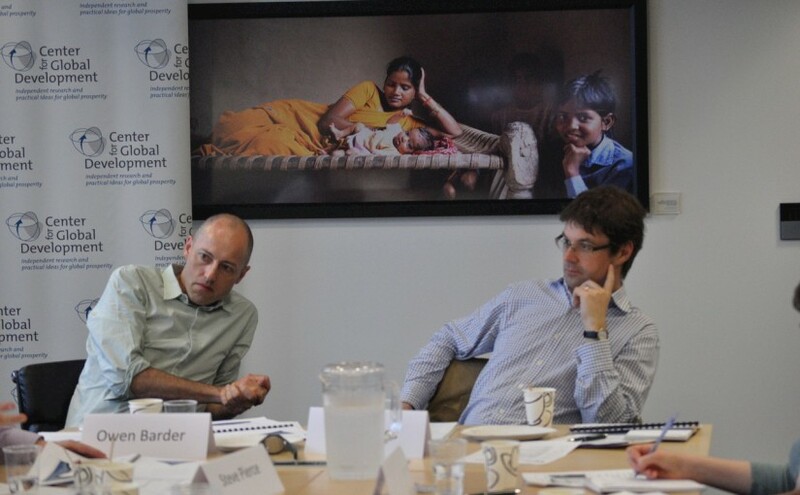 Could Development Impact Bonds improve the management of aid-financed services? For a variety of reasons, service delivery financed by aid can be very inefficient. Much of the money can end up in the overhead costs of organisations that pass the money along very long supply chains, or end up paying for the bureaucracy of planning, monitoring and reporting how the money was used. The intended beneficiaries of aid have no way to identify failure or reward success, and no voice or representation, so there is no bottom up pressure to improve. Many of these problems are an unintended consequence of donors having to mitigate the risks inherent in providing money in advance of outcomes being achieved. Could Development Impact Bonds enable governments and donors to invest more in prevention, to avoid bigger problems later? Underinvestment in prevention is a problem for many governments: for example, if we provide too little preventative health care, we end up having to pay for operations and medicines (as well as creating misery from poor health). It would be cheaper to prevent malaria from taking hold again in Zanzibar, than to have to pay later to bring it down again. Can Development Impact Bonds enable donors to focus on paying for what they get, instead of focusing on getting what they paid for? Results based aid and results based finance (there is a technical distinction between these terms) are based on the idea that payments are made when services are delivered. But in very poor countries, it is difficult to expect governments to provide services unless someone is willing to put in the money up front. When donors do this, they are drawn into micromanaging how ‘their money’ is used, leading to huge costs of administration and coordination, and undermining country ownership and the use of country systems. Could Development Impact Bonds enable small scale investing and giving? Could schemes be designed – perhaps building on the example of Kiva – in which a large number of small, individual investors put money into development opportunities in the expectation of both a financial and a social return? Alternatively or additionally, might individuals and companies be more willing to make donations for development – perhaps building on GlobalGiving – if they know they will only be asked to pay for an outcome when it has been proven to have been achieved, rather than, as now, on the promise that the money will be well used? There is a strong parallel between Development Impact Bonds and the case made by our colleagues at CGD for Cash on Delivery Aid. In both cases, the focus is on paying for outcomes, leaving discretion for developing countries, including their private sector and NGOs, to find ways to deliver the services. Development Impact Bonds could solve one of the potential conundrums of results-based aid: who is going finance the service in the first place if the donors won’t pay up until the outcome has been achieved? The Working Group has a lot of questions to address in the coming months. It will need to consider how Development Impact Bonds can work with the grain of country ownership and strengthening of country systems. Will investors, however socially-responsible, invest in something as risky as development? Does the involvement of private investors add sufficient value to justify the risk premium they will need to be paid? (If not, this is just an expensive way for donors to borrow.) Are there examples of Development Impact Bonds which can be self-financing for developing countries, or do they all require donors to be involved to pay back the investors? Will it be possible to measure these outcomes in developing countries, and can changes be attributed to investments with sufficient certainty? If we can answer these questions, and solve some thorny design issues, then Development Impact Bonds could offer a new vehicle for private and public investors, small scale and large scale, who want to invest in development. We are confident that if anyone can find good answers to these questions, it will be this group of people. For more information, you may be interested in this briefing note by CGD and Social Finance. We would welcome any ideas and analysis which might contribute to the Working Group’s thinking, and we will provide regular updates as the work progresses. If you will be calling these instruments bonds, and you are going to offer it you say for “public investors, small scale and large scale” then I sure hope you do not forget to check up that you are in full compliance with any laws on issuing securities. Will these bonds be listed… freely tradable and their current price known? That would bring a lot of transparency about how things are going. Whatever you do, if you are going to sell this as a bond with the possibility of a financial return, make sure you do not oversell it. Because, if there is anything investors like less than not being repaid, is feeling they are being taken for fools. How are you going to measure outcomes reliably (and reasonably cost effectively), let alone attribute them to specific interventions? This has been more than just an achilles heel of development efforts for decades – it’s been a whole missing leg, that can’t be assumed away. I’m sure you have some smart approaches. I’m looking forward to learning more about them. The bonds a complicated, since they are dependent on performance (like stocks) but pay out on a fixed timescale (like bonds). The first part means that the idea of ‘revenue’ is not lost from the system, and this is, as you say Alex, the achilles heel of the development world. Because no matter how much we know about the costs (the money that we spend), unless we have a good measure of the revenue (social/health/development aims reached) then we cannot calculate ‘profit’ (revenue/cost). Intelligent ways of measuring impact are constantly being developed but assessing impact can require levels of buy-in from the implementers of interventions that they are untenable. Since the whole system rests on this, the rate of return on these bonds would have to be very high to satisfy the market. Why would an investor invest in these bonds instead of simply lending directly to the government of the country? That would only happen if the rate was competitive. Which means that the governments take on the cost of the additional risk after-all and are no better off than they were before. The UK programme operates in an environment wherein sovereign bonds perform the role as an underwriter. In a developing context where there may not be any sovereign bonds, what will happen ex post, in a situation where the market economy and tax collecting capacity cannot cover the now extra debt? Will the countries in such a fix then receive loans at concessional rates? If it is going to be the later, then what has really changed? This is an excellent idea. What is lacking in much of the developed world is a means for investment to flow and the structures in place to provide some certainty that any returns will be dispensed equitably. Most African countries do not house stock exchanges or publicly list companies that might be of interest to buyers from elsewhere. At a level below exchanges though there are a myriad of problems with making contributions where you anticipate a beneficial exchange (I mean a profit). There is also incredible opportunities. Western investors cannot access them without being present in person in the countries that interest them. It is why everything moves so slow in Africa. These types of bonds may just prove to be the stroke of genius necessary to bridge the gap between the human capital and energy on the ground and the investor sitting in office across the world. He wants a good return…they want jobs and opportunity. Somewhere in the middle is required a trusted agency to collect from one and deliver to the other in a timely, responsible and transparent way. Everyone needs to know up front what the risks and rewards are. The beneficiaries of capital might be an expanding farm in one region or a startup aquaculture project in another. They may or may not be operated or controlled by NGO’s or charities but by local skilled entrepreneurs. I love this idea because it is not micro-finance. The potential here is much grander and the returns potentially stellar. Whereas micro-finance connects individuals on the edge of poverty with small amounts of capital to improve their lives it has shown too many failings. This idea though has the possibility to connect the professional expertise, training and experience of an army of volunteers and aid workers with the people who most need capital and development assistance. The magic is in the oversight. The grease to make it all work, sponsor the projects, connect with governmental agencies, conduct advertising and network the globe for contributors to assist with the startup is an umbrella group. Someone with integrity and a good reputation. Who can step into that role? Really an excellent idea, Owen. Africa wants jobs , not charity. Make it work. Thanks for all these great comments. @Alex – we completely agree. Measuring outcomes and impact is a key challenge for all development efforts, including (but not restricted to) results based approaches. Traditionally aid projects have not created good incentives to measure outcomes and impact: the result is that we have put a lot of resources into tracking inputs, processes and activities, but there is still far too much that we do not know about the evolution of key outcomes (such as infant mortality), still less about the impact of development interventions on those outcomes. There are some development interventions for which it will always be hard, and perhaps impossible, to measure impact. Those don’t seem to be obvious candidates for any kind of results-based approaches. But there are lots of others which can be measured. One of the advantages of a results-based approach is that it focuses everyone’s attention on both measuring the progress that is (or is not) being made, and on measuring the contribution of particular interventions to that progress. Picking up your aside about measuring outcomes ‘reasonably cost effectively’ – it may be that reliably measuring outcomes is not significantly more expensive – and perhaps a good deal cheaper – than tracking inputs, processes and activities. If it does push up administrative costs a little: well that seems likely to be money well spent, given the huge waste involved in spending money on things that either do no work as well as they could, or do not work at all. @Calum – It is worth unpacking your analogy of revenues, costs and profits a little. In normal markets, ‘profit’ does not describe the entire social surplus. For a firm, there is a producer surplus, or profit, defined as revenue minus cost, but there will usually also be a consumer surplus which we often cannot measure. Nobody claims that because we cannot describe the entire social surplus, let alone measure it, markets can never work, or investment is unbearably risky. Now let’s bring that back to Social Impact Bonds. In the case of the Peterborough Prison pilot, part of the benefit to society is that there will be lower rates of crime, which benefits potential victims of averted crimes as well as benefitting the criminals who are able to live more rewarding lives, and their families. All of this is important, none of it is measured. The revenues which finance the intervention are simply the cost-savings which accrue to the Ministry of Justice – namely, the savings they make from having fewer people in prison. This is easily quantifiable. The fact that there is a social surplus over and above the benefits for the Ministry of Finance, and that this surplus is highly uncertain and difficult to measure, does not make it impossible to construct a deal based on the part we can measure. Provided that enough of the impact can be reliably assessed and remunerated, it is not necessary to assess all of the impact. That means that I do not agree with your conclusion that “Since the whole system rests on this, the rate of return on these bonds would have to be very high to satisfy the market”. Nonetheless, it is important to manage the risk facing investors carefully: the ideal situation is that you transfer the risks which can be better managed by the investors (or people acting on their behalf). One consideration is the timescale over which outcomes are achieved: it may be necessary to link payments to outputs, or a combination of outputs and outcomes, if this achieves the right balance of risk transfer and predictability. Furthermore, there are lots of reasons why an investor would rather invest in bonds linked to a specific project instead of lending directly to a government. This is true in both developed and developing countries. In many developing countries, investors are less likely to have confidence in a government’s delivery capacity and ability to pay back a loan. It is easier for investors to contract with an intermediary organization which would take on the role of managing service provision and liaise between governments, funders and service providers. It is possible that the eventual funder will not be the government but an international organization or aid donor. Furthermore, the purpose of using this kind of approach to development finance is to recognize that investors will often have more to offer than capital. Their involvement and expertise can increase innovation and efficiency in the delivery of interventions. Good question. We haven’t yet got to the point of suggesting specific structures. It seems to us that there are broadly two cases. In one case (which might be the less common), either developing country governments have the money in their budgets to fund the outcomes, or there are cash savings sufficiently quickly as a result of the intervention funded by the Development Impact Bonds, so that investors can be remunerated directly by the funds released or by the governments. In the other case (which might be more common), we envisage that a donor or group of donors would make a binding pledge to remunerate investors if the results are achieved. (As we noted in our blog post, this is not really a bond in the conventional sense). In this case, the donors, not the government, are acting as the underwriter. @Cam – Many thanks. We too are optimistic that Development Impact Bonds could play an exciting role. We are grateful to you for your enthusiasm. This is the second time I read about DIB since it was first mentioned on Devex a few weeks ago. I think that the notion of “bonds” confused the public since they don’t necessarily need to be traditional issued bonds with specific dates. I am sure it has been done elsewhere but here is an example of an Impact Bond issued by the Inter American Development Bank in the US. There are no mentions of success to raise capital and/or delivery streams. There are also no mentions on how impact or outcomes will be measured. The discussion seems to focus on the design of the DIBs but I think one of the most important components should be the delivery scheme in the context of an already complex aid delivery, effectiveness and transparency discourse. I have traveled intensively in Latin America and Africa on the subject of innovative financing mechanism. At the same time we are having high level meetings with senior government officials, the private sector, and community development organizations to see how DIBs or new mechanism could fit. Official Development Assistance is decreasing at record level while Private Development Assistance is contributing more to address increasing needs in developing countries. In the host country perspective most multilateral organizations confound transparency and effectiveness. There is a plethora of maps with DOTS now from every agency and for every organization. The unfortunate part of this is that for the host country it’s impossible to makes sense of all these maps and how individuals’ dots contribute to impact and outcome. Programs are not designed to see the correlation between activities. For example … investment in health outcomes would greatly increase with similar investment in education, housing, nutrition, etc! The Paris Declaration did little yet to increase effectiveness and ownership. Now with increasing PDA activities and flow, the situation becomes even more complex because these relationships are not strategically developed in the spectrum of the host country strategies. PDA activities are often is areas of what would be considered of national sovereignty and tend to operate outside of government public programs which quite often weakens the sector that they are trying to address. Now back to DIBs – I think that there would be more to gain if these discussions would also take place here where the investment would eventually take place. We are in discussion with government officials and hopefully we will count on your support to come and discuss this promising new scheme but here, in the context of fragile and complicated economic, cultural and environmental framework.